The daughter of Alcinous, king of the Phaeacians and his consort, Arete. When Odysseus shipwrecked on Alcinous' island, Scheria, he was found by NausicaÃ¤. She received him with elegance and great hospitality and brought him to her father's palace. She is one of the mostcharming figures in the Odyssey. To read about her in the context of the story, you can check out the short version of the Odyssey in the Myth Pages. The picture on the right is a painting of NausicaÃ¤ by Frederic Lord Leighton. The first time I heard her story I didn't pity her at all - which is really harsh. Niobe was the Queen of Thebes, but she wasn't very smart and she was very very proud of her children, so one day she made the mistake of going around and telling everyone that she had 14 kids, and hey! wasn't that better than Leto. After all, Leto only had two. (Which happened to be Artemis and Apollo.) Artemis and Apollo, when they heard, were enraged and flew down to the home of Niobe and Amphion (her husband). Apollo killed all of the seven sons, and Artemis killed all seven daughters (save Chloris, the youngest daugher, but I don't know that part of the story yet). Anyway, Niobe was inconsolable, and she fled to Mt. Siplyon where she sobbed and sobbed. Eventually the Gods turned her into a stone (out of annoyance or pity) but she continued to cry. Her statue cries still today (no joke). This story, in better form, will be appearing on the Myth page. Nyctimene was gorgeous, like, totally a Miss. Lesbos and Ethiopia. Actually she really was, since her Daddy was king of those places, but the thing is that she was such a hotty that Dad wanted in and seduced her. After the deed was done, Nyctimene felt unbelievably ashamed and went and hid deep in the woods. Happily, Athena eventually took pity on her and changed her into a nocturnal owl. Oeno was one of the three Oenotropae, or daughters of Anius, sister of Spermo and Elais. Oeno could turn anything she touched into wine. She and her sisters were captured by the Greek forces on their way to the Trojan War, but Dionysus turned the sisters into doves so they could escape. The name, Oenone, means the "Queen of Wine." She is a tragic character in mythology. She was married to Paris when he abandoned her and went off to marry Helen of Troy. This obviously sucked for Oenone. Later, in the Trojan War, when Paris was mortally wounded, she was the only one who could cure him. In her bitterness she refused. Later, as his condition worsened, she consented and came. But it was too late, and Paris died. In her sorrow, she killed herself. Omphale was a very famous queen of Lydia. She was one of the first dominatrixes, and was thrilled when Heracles (Hercules) came to her asking her to punish him (he needed penance for killing this dude named Iphitus). Omphale had him wearing women's clothes and doing women's work, while she walked around in Heracles' lion skin and carried his club. She was pretty cool, and her name means "Navel." Pamphile was, apparently, a sorceress who could control the moon. I know nothing else about her, nor do I know where this information came from. 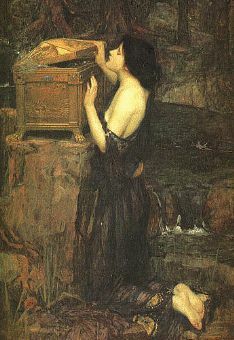 Pandora is a woman who was made by all of the Gods, and given a box that she was instructed not to open. But, the Gods also installed curiosity in the poor girl, and once she was placed on Earth, what could she do but open the box. All at once all of these nasties flew out and started plaguing mankind. Luckily she closed the box in time to keep Hope in there, who would have perished against such odds. After the great flood brought by Zeus, the nasties laid off a little more. That totally awesome painting of Pandora was made by the fabulous John William Waterhouse, but there are more of her in the Gallery. A somewhat more extended version of this story can be found in the Myth Pages. Pasiphae was the daughter of Perse and Helius and the wife of King Minos (therefore, she was Queen of Crete). Minos insulted Poseidon this one time, and Poseidon made Pasiphae fall in love with a bull. 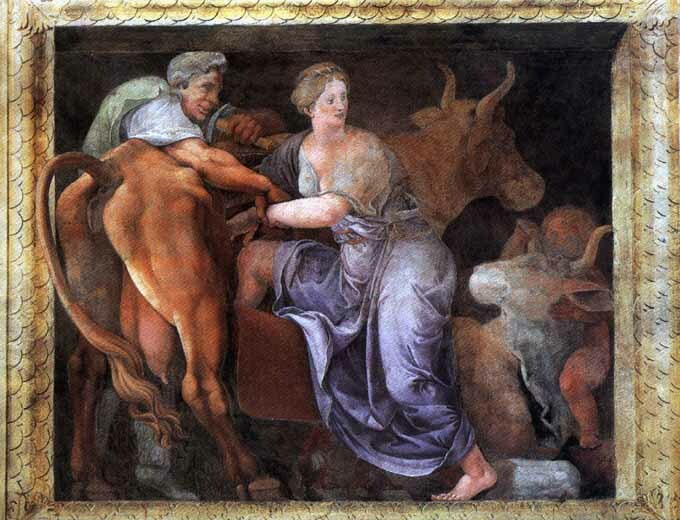 So Pasiphae, in love with this bull, got this great inventor/builder named Daedalus to build her a wooden cow she could crawl inside, and through it, mate with the bull. Through this, she became the mother of the monster the Minotaur. She was also the mother of Glaucus, Andogeus, Phaedra, and Ariadne by her husband, Minos. Penelope was the wife of Odysseus, and a good wife at that. You should already know about her because EVERYONE should know the Odyssey, but I guess it's okay if you don't. One story about her is that while Odysseus was away (yes, he was being kept away by Calypso and some other gods) everyone thought Odysseus was dead, and were trying to get Penelope to remarry. Well now, she didn't think Odysseus was dead, but she wasn't certain. What she WAS certain of, was that she didn't want to remarry. So, to fool everyone, she said she would marry when she finished making a funeral shroud for her aging father-in-law (Laertes). But she tricked everyone because she would weave it all day, and then unravel her weaving all night. When Odysseus was an old man and was unwittingly killed by his stepson, Telegonus, Penelope married Telegonus. There is more to that story than there is room to be written here, so go check out the short version of The Odyssey in the Myth Pages. 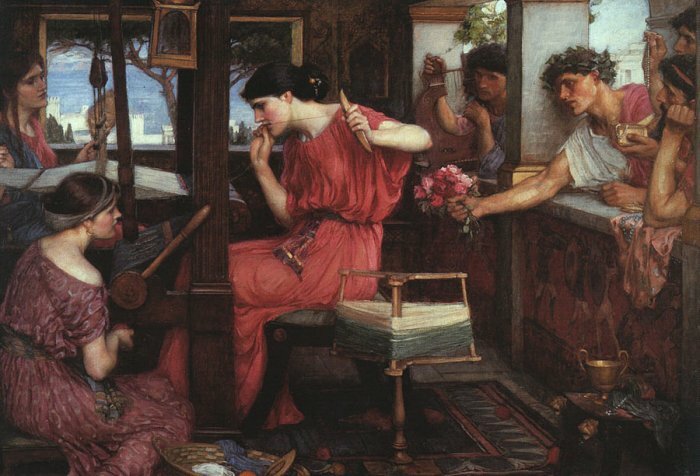 The painting on the left is John Waterhouse's "Penelope and Her Suitors". She was the daughter of a robber named Sinis (Sinis used to kill his victims by bending down two trees and tying their arms to one tree and their legs to another, Theseus killed him the same way). So when Theseus killed her dad, he took her as a concubine. She bore him a son named Melanippus. Pero was the stunningly beautiful daughter of Chloris and Neleus (King of Pylos). Neleus wasn't exactly a nice guy, but when Melampus cured his son of a fatal illness, he agreed to give him 2/3 of his kingdom, and apparently Pero was a part of the deal. Melampus gave 1/3 of the kingdom (and Pero) to his brother, Bias. So that's who Pero ended up with. She was not a nice person. She was the daughter of King Minos, and the second wife of Theseus. She fell in love with her stepson, Hippolytus, and because he would not have her, killed herself. She made it look like it was because Hippolytus had raped her. Theseus saw this and cursed his son, who died soon afterward. The story of Philomela and her sister Procne is another tragedy stemming from the unbreakable love the two shared. Their story is written in the Myth Pages, and you should definitely check it out. It's an incredible story, but it is also full of violence and horror, so don't read it unless you are ready to feel slightly sick. Although I will not attempt to tell the story here as well, you should know that after her ordeal, which involved having her tongue cut out, she was turned (through the pity of the gods) into a swallow. Phyllis was a Thracian princess who had a crush on a boy - well, that's not fair, it wasn't a crush - they were in love. The boy's name was Demophon, and he was a son of Theseus. They were in the middle of their love affair when the Trojan War commenced, and Demophon went off to join the effort. After the war was over, Demophon started home - but his boat sprung a leak so the voyage was delayed. But Phyllis couldn't know that. She waited for him by the shore day after day, but after nine months she died of sorrow in a place named Enneodos. Athena took pity on her and changed her into an almond tree. When Demophon came home, he hugged the tree (feeling her presence, or just being a hippy), and the tree burst into flowering blooms instead of leaves. Every year the Athenians dance in Phyllis' honor. The name "Phyllis" means "leafy." She is associated with Rhea. 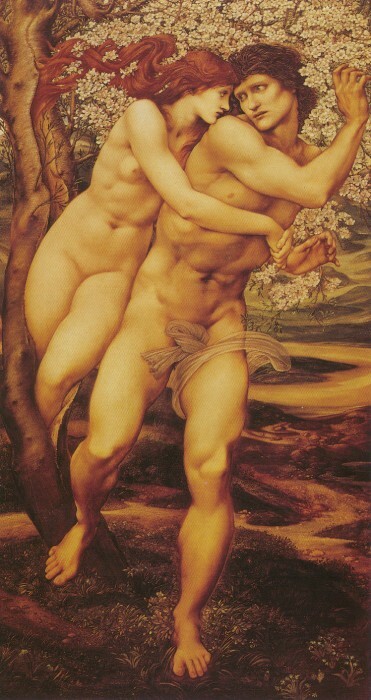 The painting is called The Tree of Forgiveness, by Edward Burne-Jones. Phytalis was a priestess of Demeter who was raised to demi-goddess status by the Goddess of the Harvest. Polymede was the daughter Autolycus (a famous thief) and Neaera and was the mother of Jason. Thing was, she thought that her uncle would kill the baby, so she got some girlfriends together and they cried over him like he was stillborn, then they sent him off to Chiron the centaur. She didn't see him for 20 years, and then he disappeared with the Argonauts at the evil uncle's decree. At the end of her life that uncle of her's came after her and killed her husband and her new baby, but she got away from his soldiers and ran to Pelias' throne (Pelias=her uncle) and cursed him and killed herself. That's like a totally serious curse and pretty impossible to get off you. And, true to form, Pelias died in a very nasty way at the hands of Medea. Polyxena means "many strangers", and is a good name for this girl, because that was her downfall. Polyxena was the daughter of King Priam during the Trojan War. Achilles fell in love with her, and Priam offered her hand in marriage if Achilles would make the Greek army talk peace. Achilles agreed, but when he came to the temple of Apollo unarmed to talk, Priam's sons ambushed him and shot him in the heel, killing him. After Troy lost the war, Achilles' ghost returned and demanded to have Polyxena sacrificed to him. Achilles' son, Neoptolemus, dragged Polyxena to the altar and ruthlessly slayed her right there. 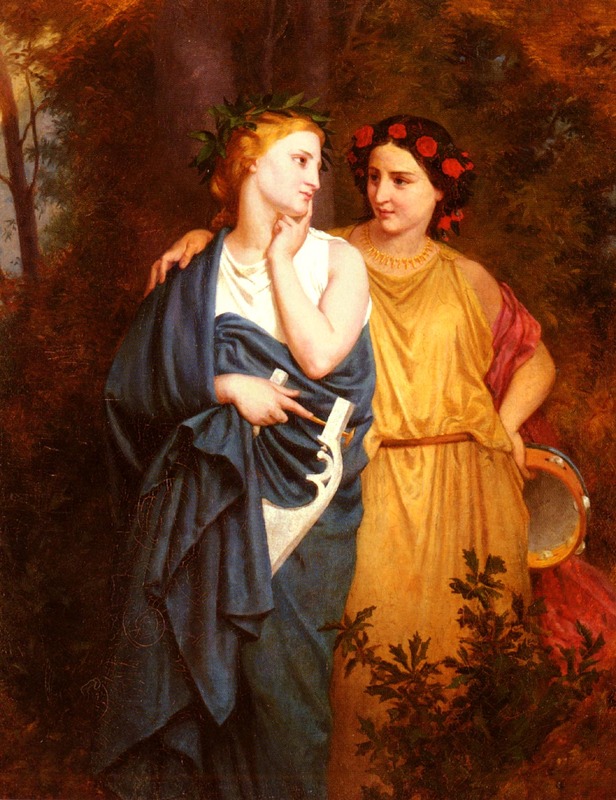 The story of Procne and her sister Philomela is another tragedy stemming from the unbreakable love the two shared. Their story is written in the Myth Pages, and you should definitely check it out. It's an incredible story, but it is also full of violence and horror, so don't read it unless you are ready to feel slightly sick. This is a really cool story, but a little long, so I don't want to write it again. See Stheneboea. Yet another example that Heracles wasn't all sweetness and light: Pyrene was raped by Heracles, and from that violence bore a snake. She was terrified at what she had given birth to, and fled into the mountains where she was devoured by wild animals. The mountains are called the Pyrenees today. Salamis was the daughter of Asopus. She was abducted by Poseidon and bore him the son Cychreus. I know nothing more than that, and that I know only from P J Criss. 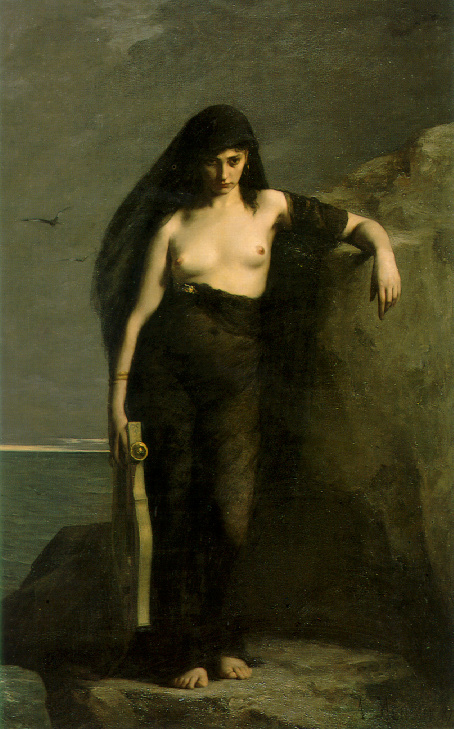 Sappho is not a possible character of mythology. She was a renowned poet, whose writing was so beautiful that Plato referred to her as the Tenth Muse. Some peg Alcaeus as her lover. Others give the honor to Phaon (a young boatman who didn't return her love), for whom she leapt into the sea in sadness. She had a daughter named Cleis, and taught a group of young women the art of poetry. She was devotedly attached to them and wrote their bridal odes for them when they left her to get married. Looking back on the group, later writers accused Sappho of vice and immorality, and it was from this that the terms for female homosexuality, "lesbianism" and "sapphism", came into being. The painting at left is by Charles August-Mengin. Scylla was the daughter of King Nisus of Megara. When Minos attacked Megara, Scylla fell madly in love with him. She knew Minos could not win, because her father had a magical power on his side (coming from a lock of purple hair on his head). She promised to deliver Megara to Minos, and cut the purple lock off her father's head and gave it to him. Minos took the lock, but despised Scylla for betraying her father. Scylla threw herself into the sea in despair. Some stories say that she was changed into a lark and her father into a hawk. Semele was a Princess. One day Zeus came to her and the two made love. She became pregnant with a son, Dionysus, but jealous Hera ended up getting rid of her before she could have the baby. Zeus saved it and sewed it into his leg from which it was born. She was killed when she made Zeus swear (because of Hera) to show himself in all of his glory. He could not break his oath, so he did, and she was burned to a crisp. Bye-bye human-girl! Semiramis is really cool because she was realistic. Her birth was a little out there (she was said to be the daughter of the goddess Derceto who abandoned her in a field as a baby after killing her father. Little Semiramis was raised by doves who stole food for her from nearby shepherds). Eventually, probably because of her great beauty, she was married to a king's adviser, Onnes. She gave him lots of great advice and when he took her with him on a battle campaign, and she supplied the battle plan that won the war, even the King recognized her wisdom. So this King (Ninus) offered Onnes, his own daughter, in a "trade." Onnes refused, but when Ninus threatened to blind him, Onnes committed suicide and Ninus married Semiramis anyway. She continued to give great advice until she died, and is credited by some with the "Hanging Gardens." Her name means "raised by doves." The Sibyls were ten women who had the gift of prophesy. They were each named according to the place they were from, and the most famous was the Cumaean, who Aeneas talked to before heading down to visit Hades. Some count Cassandra as one of them, but she wasn't really. After a long time there was a body of literature that purported to collect all the prophesies of the Sibyls called the Sibylline books. There's a story that the Cumaean Sibyl offered the nine books to the Roman Emperor Tarquinius, and he turned her down cuz her price was too high, so she burned three and offered what was left at the same price. Tarquinius said no again, and she burned three more. Finally, he bought the last three at the jacked up price, and they were a big deal in Rome for a really long time. But wait, I hear you Latin and Roman scholars asking, how could the Cumaean Sibyl live to offer those books to Tarquinius if she also helped out Aeneas? The answer to that is she lived, they say, about a thousand years. But, wait, wasn't she human? Yep, but when she was dedicated to Apollo as a kid, she got a really good deal, and she would have stayed looking young, too, if she'd slept with Apollo - but she turned him down (I'm impressed). She eventually died when she touched the clay of a seal that had earth from the country she wasn't allowed to go back to. Enough about her. On the right is a painting by Edward Burne-Jones of the above described Cumaean Sibyl. Side is one of those women who life just isn't fair to. She didn't do anything wrong. She said nothing to offend anyone. She was simply the unbelievably beautiful wife of Orion. Why her life was ended so abruptly is just not right. Hera saw her, and was having a bad hair day or something, and threw poor Siden into the Underworld for daring to rival her in beauty. That's it. That is a pretty raw deal. There were other unfortunate women named Side as well, one of whom committed suicide on her mom's grave cuz her dad kept trying to sleep with her. Yuck. A pomegranate tree grew from her blood, and her pops turned into a kite (not the toy, the bird!). Sidero was the wife of Salmoneus and the cruel stepmother of Tyro. She seriously mistreated Tyro, and so when Tyro's two sons, Pelias and Neleus, grew up, they hunted Sidero down. Sidero ran all the way to the Temple of Hera, but Pelias went in and speared her anyway (gaining the undying hatred of Hera). There was this King of Cyrus named Cinyras who boasted that his daughter, Smyrna, was more beautiful than Aphrodite. Aphrodite was very pissed, and made Smyrna fall in love with her father. One night, Smyrna got her dad (Cinyras) drunk, and slept with him and got pregnant. When Cinyras realized what he and she had done, he chased her out of the palace at swordpoint. Aphrodite transformed Smyrna into a myrrh tree just as Cinyras caught her and split her in half. From the split came their baby, Adonis (yeah, you should recognize that name), with whom Aphrodite eventually fell in love. Sparta was the daughter of the river-god Eurotas and his wife Cletas. Eventually she became the mother of Eurydice (whose story I LOVE!). Spermo was one of the three Oenotropae, or daughters of Anius, sister of Oeno and Elais. Spermo could turn anything she touched into corn, or grain seed. She and her sisters were captured by the Greek forces on their way to the Trojan War, but Dionysus turned the sisters into doves so they could escape. Stheneboea was the wife of King Proteus (of Argos), who was visted by Bellerophon in his search for purity. She fell in love with Bellerophon, but when he renounced her advances, she got pissed and told Proteus that Bellerophon had raped her. Proteus was really angry, but he couldn't bring himself to kill Bellerophon. It was the beginning of Bellerophon's heroic journey, during which he conquered the Chimaera, the Solymi, and the Amazons. When, in the end, Bellerophon returned again, Stheneboea tried to escape on the back of Pegasus (the flying horse born from Medusa's body that made Bellerophon so cool in the first place). Pegasus wasn't too peachy about that, and dumped Stheneboea into the sea where she died. Stheneboea is also called Anteia. She wasn't a very important member of Greek Mythology, but who cares? She was the daughter of Aeolus (the keeper of the four winds) and his wife Enarete. That is her only known claim to fame. You know Ajax? (ie, Aias) Well, he was a big Trojan War hero, and (shocker!) he had lots of concubines. Tecmessa was one of many. 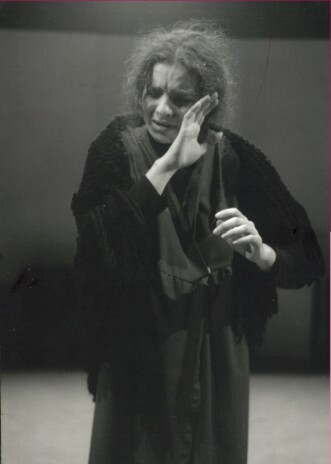 She is sometimes referred to as the mother of Hecuba, and she was the wife of Cisseus. Theano was Telecleia's daughter (with Cisseus) and therefore the sister of Hecuba, but instead of marrying a king, she married this Trojan dude named Antenor who was all rah-rah about Greeks during the Trojan War (he shows up a few times in the Iliad, among other places). In addition to marrying a liberal, she was a priestess of Athena, and was way cool. She had a ridiculous number of children - most of whom died in the Trojan War - but because of her husband's work, when Troy lost, the Greeks spared the rest of the kids and Theano. There were some other chicks named Theano, too, but they weren't terribly important, except maybe for the Danaid named Theano who married and subsequantly killed Phantes. Anyone who has this name is cool. Themisto was the jealous second wife of Athamas. When Athamas returned to his first wife, Ino, Themisto tried to kill Ino's children. One night she dressed Ino's children in black and her own children in white, but Ino switched the clothes, and Themisto killed her own children. This story is incongruent with the other stories of Ino and Athamas, which focus on Ino as the second wife and the jealous first wife as Nephele. Theonoe was the kidnapped daughter of Thestor who fell in love with her sister, Leucippe, thinking that she was actually a handsome young priest of Apollo. Read how it all turned out in Leucippe's entry. Theophane was a beautiful maiden who had many many suitors. This, of course, attracted Poseidon, who turned Theophane into a ewe to hide her from the suitors. In this form, he "made love" to her, and from this union was born the ram with the Golden Fleece. Thisbe was one half of the famous "Pyramus and Thisbe" duo featured in myths starting with Ovid's Metamorphoses on to Shakespeare's A Midsummer Night's Dream and, more recently, the American musical The Fantastiks. Thisbe, you see, was this Babylonian hottie who had a boyfriend living next door. But back then, they were more about virginity and then marriage with someone you'd never spoken to, so both their parents forbid it. On the up side, there was a hole in the wall separating their gardens that they were always talking through. So anyway, one day they arranged to meet at this tomb (now, I don't know what they were expecting meeting at a dead dude's house). So Thisbe got there first, and then this lioness dragged up an ox she was eating and Thisbe totally wigged out and booked out. Of course, she also dropped her scarf, which the lioness nuzzled. To make a long story short, Pyramus came, saw the bloody scarf, assumed Thisbe was dead and killed himself, and then Thisbe killed herself, and the mulberry tree they had met beneath was stained from white to red by their blood. 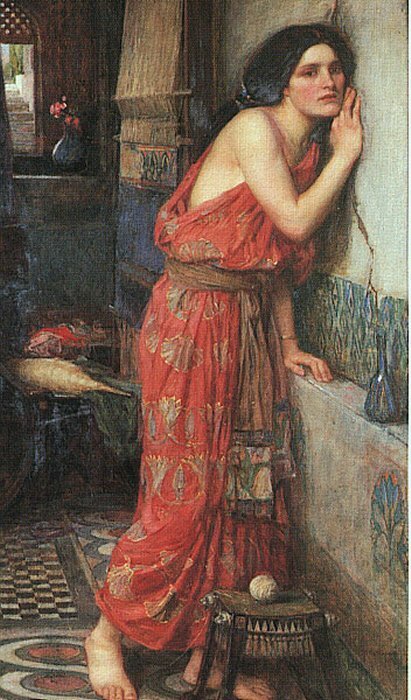 The painting at right is another of John Waterhouse's masterpieces. 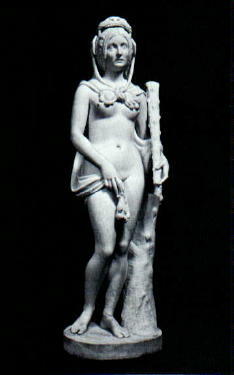 Tyro was the beautiful daughter of Salmoneus who was violated by her uncle Sisyphus, who wanted revenge on his brother. Tyro killed the two sons from this union. Later, she married Cretheus (another of her uncles), but she was in love with Enipeus, the patron god of the river. Poseidon really dug Tyro, so he transformed himself to look like Enipeus, and made love to her. Tyro bore two sons, Pelias and Neleus, from that union, and in desperation, tried to expose them on a mountain. Luckily a housekeeper found and raised them. The two grew up and killed Tyro's stepmother (Sidero), because they knew she had been cruel to Tyro. Another one of her uncles was Athamas (check out Ino for more). Xenodike was the daughter of Minos and Pasiphae and the sister of Phaedra and Ariadne. Her name means "justice to strangers," but beyond that I know nothing about her.